Scuba Diving Resort Courses - A Great Way to Get Your Feet Wet! A Great way to get your Feet Wet! OK, so you're thinking about becoming certified. But still not sure? Scuba diving resort courses could be the answer. Many resorts offer these introductory courses. If you're on an all inclusive Caribbean vacation, many times these courses are included in the price. Even more of an incentive to try it out. The time spent on the lecture and in the pool can vary from one to several hours. Most I have seen and the ones my friends have taken typically lasted 2-3 hours. Sometimes the open water dive portion of the course is included and sometimes you have to pay extra. My friends have paid anywhere from $0 to $45. 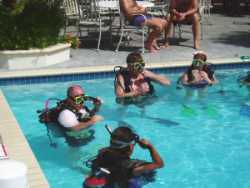 Scuba equipment is usually included in scuba diving resort courses. It may seem overwhelming at first, but just relax. You will get it. Even if you don't understand everything, you can still have an enjoyable dive. Most resort courses limit your dive to a depth of 30 or so feet. This way you will not get "the bends" if you surface too quickly. Just be aware that sometimes you have to be your own police. Most operators are responsible but always be aware of your depth. 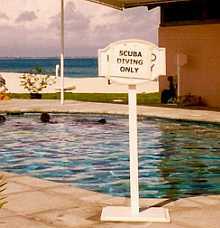 My husband dove to almost 70 feet during one of his scuba diving resort courses (before he was certified). This is crazy. The risk of getting hurt is just too great. No one without the proper training should go that deep. This is not to scare you. My nieces and nephews have taken scuba resort courses without any problems. They were between 13-15 when they took the courses. You can do it too. So if you have any doubt about diving, resort courses are a great intro. You don't have to spend alot of time or money to get a feel for diving. A few hours and you'll probably know if you want to continue. Give it a try and get your feet wet on your next Caribbean vacation. It's worth it!